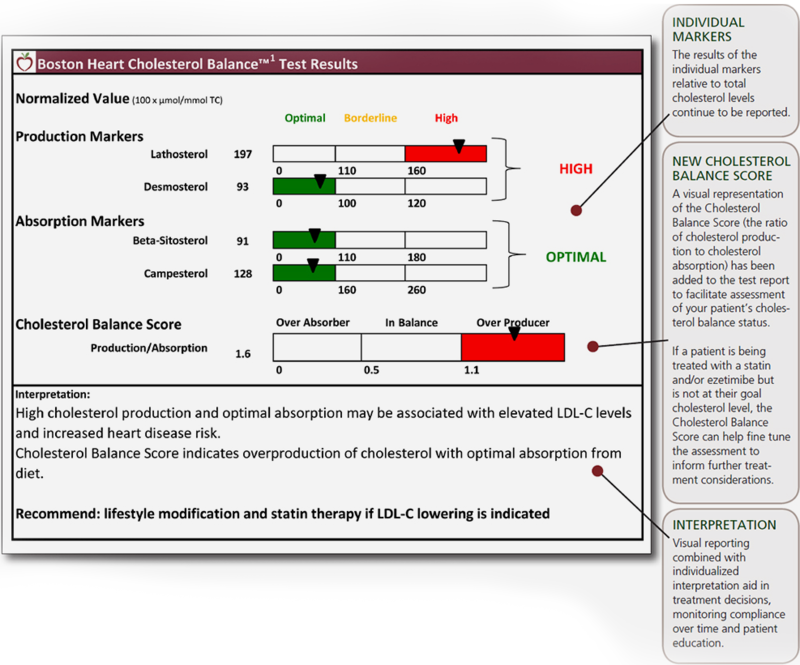 Boston Heart Cholesterol BalanceTM test. The new process captures the complete cholesterol production pathway and all of the major absorption markers. This additional information provides a more complete assessment of CVD risk and helps better guide your treatment options to most effectively manage your patients to their LDL-C goals. Developed and patented by Dr. Thomas Dayspring, one of the most requested educators in the US, the Sterols Algorithm is designed to guide physicians in respect to Sterols and Phytosterolemia. Also known as sitosterolemia or xenosterolemia, which is a “rare” autosomal recessively inherited lipid metabolic disorder; while this condition appears to be relatively rare, more than likely it is significantly underdiagnosed and many patients are probably misdiagnosed with hyperlipidemia. absorption markers can indicate which cholesterol pathway needs to be addressed with therapy. Patients with elevated cholesterol production values can be treated with a statin, which inhibits cholesterol production. Body cells and the liver produce 75% of circulating cholesterol, while dietary intake of plant sterols contributes 25%. Most (80%) of in vivo cholesterol production goes through a major production pathway, measured by the precursor lathosterol, while the remaining (20%) goes through desmosterol. Matthan NR, Restighini N, Robertson M, Ford I, Shepherd J, Packard C, Buckley BM, Jukema JW, Lichtenstein AH, Schaefer EJ. Cholesterol absorption and synthesis in individuals with and without CHD events during pravastatin therapy:insights from the PROSPER Trial. J Lipid Res. 2009;51:202-209.
van Himbergen TM, Matthan NR, Resteghini NA, Otokozawa S, Ai M, Stein EA,Jones PH, Schaefer EJ. Comparison of the effects of maximal dose atorvastatin and rosuvastatin therapy on cholesterol synthesis and absorption markers.J Lipid Res. 2009; 50:730-739. Assmann G, Kannenberg F, Ramey DR, Musliner TA, Gutkin SW, Veltri EP. Effectsof ezetimibe, simvastatin, atorvastatin, and ezetimibe-statin therapies on noncholesterolsterols in patients with primary hypercholesterolemia. Curr Med ResOpin. 2008;24:249-259. Sudhop T, Lutjohann D, Kodal A, Igel M, Tribble DL, Shah S, Perevozskaya I, vonBergmann K. Inhibition of intestinal cholesterol absorption by ezetimibe inhumans. Circulation. 2002;106:1943-1948. Cholesterol Treatment Trialists’ (CTT) Collaboration, Baigent C, Blackwell L,Emberson J, Holland LE, Reith C, Bhala N, Peto R, Barnes EH, Keech A, Simes J,Collins R. Efficacy and safety of more intensive lowering of LDL cholesterol: ameta-analysis of data from 170,000 participants in 26 randomised trials. Lancet. 2010;376:1670-1681.